I received a curious and distressing e-mail from a Pittsburgh Pennsylvania lawyer a couple of weeks ago. The gentleman contacted me after seeing my blog and was specifically interested in my perpetual problems with my Permobil M300 power wheelchair. He outlined that he was representing a family that had filed a wrongful death lawsuit against a wheelchair manufacturer and asked if I was willing to speak with him on issues relating to the Permobil M300 powerchair. I agreed to help in whatever capacity I might be of service and e-mailed back my phone number. The Lawyer again e-mailed me and said he would call the following Monday. I gathered from his e-mail that the powerchair operator was using a Permobil M300 which had somehow ignited - resulting in severe burns to his body. Sadly, the unfortunate gentleman had succumb to his injuries. Apparently the family had reason to believe that the powerchair itself was the source of the fire and responsible for the man's death. I waited for the call the following Monday but as far as I can discern none came; I did not receive a call nor was there any message on my answering machine on that Monday or for the few days that followed. 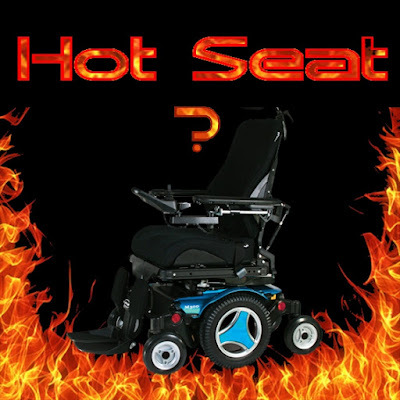 I suspect that after some consideration, the lawyer decided that in spite of all my problems with my Permobil powerchair, self-immolation (burning alive) was not one of them and my assistance would not be worth the long-distance phone call. Curious, I searched the internet for any 'deaths by wheelchair fire' in Pittsburgh and could only come up with one event that might match the description. Though it occurred in January of 2016, it does take time for wrongful death/legal suits to be filed and investigated. This seemed to be the most recent incident which fit the circumstances. The gentleman in this case was found engulfed in flames near a stove in the kitchen. The articles I found on the internet did not state the make or model of the wheelchair. There were no other specifics offered to clarify if he was cooking at the time or whether he had a portable oxygen unit, etc. The kitchen just may have been the closest exit or escape route to where he could find help. I would think the burn pattern would be telling as to whether the powerchair was the source of ignition or there was some external source or event which engulfed him in flames. I suspect from the lawyer's phone call that there was enough evidence to suspect that it may indeed have been the powerchair. After a bit more searching on the web, I was distressed to learn that powerchairs erupting in flames is not a totally uncommon problem. Apparently both Invacare and Pride powerchairs have had ongoing issues with powerchairs erupting in flames. I assume that have been adequately addressed and issues have been reduced if not eliminated. When dealing with electrical devices, I'm not sure if it is possible to totally eliminate all dangers. The overheating and fire issues have been attributed to both manufacturing defects and possibly from sustained overuse. Batteries and short-circuiting wiring harnesses have both been implicated. In some cases a five-cent fuse may have prevented a fire from a short-circuit which for whatever reason (company profit?) was eliminated. As my wheelchair technician explained, wheelchairs, as any other product or commodity, are made as cheaply as possible: Not to save the consumer money by making the item affordable, but rather by maximizing profits for the company shareholders. A few cents saved here, there and where-ever possible adds up to thousands of dollars over time. Remember the stories about how airlines stopped handing out packets of peanuts on flights or that a fast-food franchise offered one squirt of ketchup on a burger instead of two resulting in hundreds of thousands of dollars saved over a relatively short period of time. So, I cannot confirm that the unfortunate wheelchair fire I presented here was in fact a Permobil M300, nor that it was the cause death. However I did find it curious that I was contacted by a lawyer representing the family of a deceased individual who was operating a Permobil M300 when he received lethal burns. The incident described by the lawyer allegedly occurred using a Permobil M300. Again the circumstances are unknown to me and must be proven before assigning blame. Assume Permobil innocent until proven otherwise. However, I will be much more aware of any heat or smoke when operating my own Permobil or my Quantum.